Kendric Henderson’s face cringed as she slowly limped on crutches to join the march in memory of her daughter Jamyla Bolden Sunday afternoon. Although she herself had been shot in the leg by the same stray bullets that entered the family home and killed her last Tuesday night, the pain she expressed was also the result of a broken heart. Henderson would ride in a pickup truck as several hundred marchers made the mile-long journey from the corner of Ellison and Canfield Drive to Koch Elementary School – where Jamyla had just started fourth grade – to release balloons in her memory. The event was the brainchild of rapper This’l, an artist who has used his music to promote redemption from the ashes of urban decay. For most of the march, chants that were the common soundtrack as protesters marched for Michael Brown Jr. were re-mixed for Jamyla. “Jamyla means… ,” Rasheen Aldridge shouted. “We’ve got to fight back,” the crowd answered. The call and response chants would continue uninterrupted for the entire march. Marchers circled around the family once the last few filed in. The crowd responded with approval as if they were in Sunday worship service. 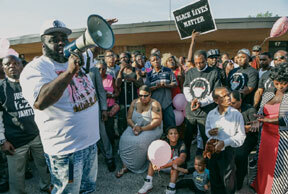 Tammie Holland of 100.3 The Beat urged everyone to be active seekers of justice for Jamyla. A large constituency of the St. Louis Urban League was also on hand showing support. “There are very few things as a grown man that make you speechless – and this is one of those things,” said Michael McMillan, president and CEO of the Urban League of Greater St. Louis. McMillan added that the Urban League was adding $5000 to the reward fund for information leading to the capture of Jamyla’s killer – nearly doubling the total reward. “We have to do better as a community to make sure that this never happens again,” McMillan said. This’l offered a reality check to the crowd. “When we were chanting we were saying they and them and show ‘them’ what justice looks like. But today, the ‘them’ is us – the ‘them’ is us today,” This’l said. “I grew up trappin’. I grew up gang banging and all of that.